Formation sign of the 26th Indian Infantry Division. When the Japanese invaded Burma in 1942, the various units in training or stationed around Barrackpur near Calcutta in India were hastily formed into the "Calcutta" Division on 20 March 1942. On 15 May, the division was retitled the Indian 26th Division. The division's badge was a Bengal tiger stepping through a blue triangle, representing the "delta" of the Ganges River, on a black background. For much of 1942, the division was heavily engaged in internal security, and not regarded as battle-worthy due to lack of training and transport. It formed part of Indian XV Corps, but late in 1942, it was taken over directly by Eastern Army. For the First Arakan offensive, all the division's brigades were detached one by one and committed to the offensive under the 14th Indian Infantry Division. In March, the offensive stalled and the HQ of 26th Division relieved that of the 14th Division, taking over the Arakan front too late to prevent a minor disaster. After this the British fell back almost to their starting point on the Indian frontier. Once reorganised, the division was in reserve for the first part of the Second Arakan Offensive, once again under XV Corps. When a Japanese counter-attack at Ngakyedauk cut off the forward troops, 26th Division was deployed to relieve them. It fought down the coastal plain to reopen the roads by which the 5th Indian Division was supplied. After the battle ended with the repulse of the Japanese attackers, the division took over the 5th Division's front and took part in the capture of two vital railway tunnels. After this, the Arakan offensive wound down to spare troops and resources for the battles in Manipur. The division was withdrawn during the monsoon rains to recuperate. Men of the 26th Indian Infantry Division preparing a meal beside a temple on Ramree Island, January 1945. Beginning in late 1944, the division was committed once again to the Arakan. During the Third Arakan Offensive and subsequent operations, 26th Division took part mainly in amphibious operations, including the unopposed capture of Akyab Island, and the Battle of Ramree Island. 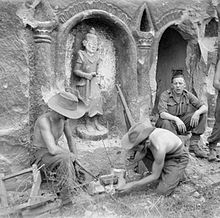 Finally in April and May 1945, the division took part in Operation Dracula, the capture of Rangoon. After the Japanese surrender, the division, under the command of Henry Chambers, reinforced other troops in Java and Sumatra, where the end of the war brought widespread disorder. The division was formally disbanded in India on 31 August 1945, but most of its units were stationed in Sumatra at Padang and Medan until November 1946, when they embarked at the port of Belawan to be disbanded in India. ^ "26 Division units". Order of Battle. Retrieved 22 October 2009. "26 Indian Infantry Division". Orders of Battle.com.